Featuring drones equipped with stun guns, night-vision cameras and nets to capture other drones, as well as a device that seizes control of rogue UAVs, here’s a roundup of some of the biggest security drone innovations in this burgeoning, bewildering market. A device that gains control of drones by hacking into their protocols could be a major boost to anti-drone efforts at military bases, prisons, and airports. Developed by Maryland-based company Department 13, MESMER doesn’t use ‘jamming’ to disable drones, like comparable products on the market. Instead, drawing on research conducted by the Defense Advanced Research Projects Agency (DARPA) into radio frequencies and Bluetooth technology, it gains access to the drone’s communication protocols. Mesmer, a black box that sports antennas and sensors, is being pitched as a solution to the growing problem of drug-smuggling drones that drop off their deliveries inside prison walls. Prison staff can set up an invisible geofence around a facility’s physical walls within which encroaching UAVs will be subject to Mesmer’s manipulations and promptly landed where staff can seize them. The anti-drone innovation can also tap into telemetry data and video feed being sent back to the operator, potentially giving them clues that could lead to their identification. Unfortunately the system only works on about 75% of commercial drones on the market, according to Scout. A Texas-based company called Fjord Austin developed a drone armed with a stun gun. The gun dispenses taser darts that unleash 80,000 volts – for comparison purposes, that exceeds the 50,000 volts usually discharged by police tasers. CUPID – short for Chaotic Unmanned Personal Intercept Drone – takes out a poor intern in the video below. “The drone can be deployed when an alarm is triggered,” the company said. “It can find a subject and send live video to the owner’s phone and ask if you want to authorise the subject or detain them. Fjord Austin (or Chaotic Moon Studios, as the company was known at the time the drone was unveiled) is not exactly a drone or security specialist and Cupid is more conceptual than a genuine tool for security professionals. It’s other innovations include a fitness app for peope in a wheelchair and a gesture control watch. Fjord Austin is said to be developing a version of the drone that uses pepper spray balls. Want to see security drones and anti-drone technology in action? 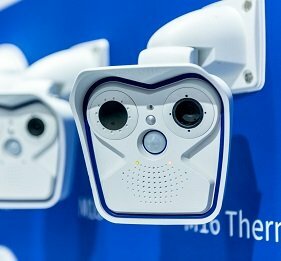 IFSEC International 2017 (20-22 June, London ExCeL) once again features the Drone Zone, a dedicated showcase of the latest in drone technology, taking place within the brand-new Borders & Infrastructure show. Click here to get your free visitor badge. In 2015 a Japanese security company unveiled a model that pursues intruders as they make their escape and take pictures of their faces and licence plates to aid identification. Equipped with a surveillance camera and LED light, SECOM’s security drone will send these images back to the control room. Secom claimed it was the first company in the world to produce such an autonomous monitoring drone for commercial use. The drone can only reach a top speed of six miles per hour, so it gives more of a warm than a ‘hot’ pursuit. However it can be useful in identifying suspicious people and cars outside the range of a conventional fixed camera. A Secom security drone costs $6,620 upfront with an ongoing $41 monthly charge. Fighting fire with fire, Tokyo police have decided the best way to take down illegal drones is with other drones. Following a major security breach in 2015, the Metropolitan Police Department (MPD) now commands a fleet of drones that take down rogue UAVs by covering them with a large net. The anti-drone drones form part of the MPD’s riot squad and patrol government buildings. If suspicious drones are spotted, a police officer will warn the operator to ground their craft. Should they refuse to do so the net-carrying drones will spring into action. The decision to use these drones was prompted by an incident in April 2015, when a drone carrying traces of a radioactive material landed on the roof of the Prime Minister’s office in protest against the government’s nuclear energy plans. The incident also prompted the government to introduce an amendment to Japan’s Civil Aeronautics Law prohibiting the use of drones above areas with a population density of 4,000 people per square kilometer or more without special permission from the authorities. In one of the world’s most densely populated countries that doesn’t leave a lot of scope for flying drones for leisure purposes. The recent ban also prohibits drones from flying closer than 98 feet away from people, buildings and cars. A California-based startup has developed a self-flying drone that it has pitched ambitiously as a ‘flying security guard’. Aptonomy says the octocopter is much cheaper than employing humans and more effective than cameras and alarms. 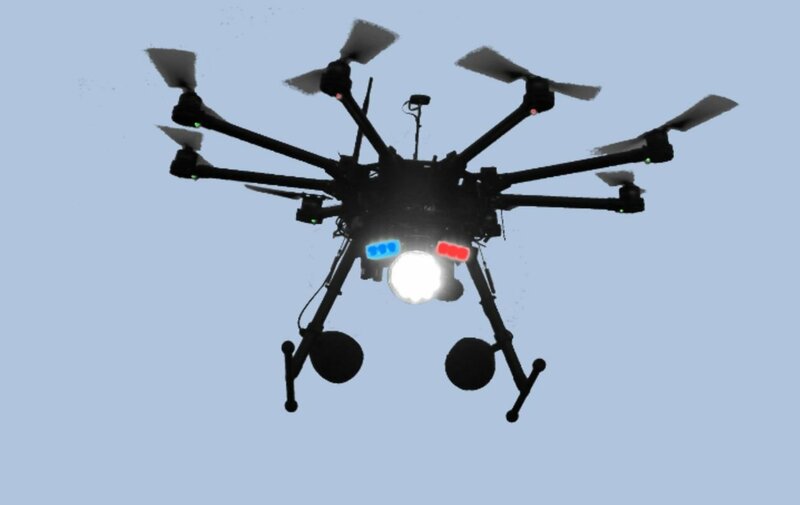 The drone is equipped with cameras as well as blue and red lights, a white spotlight and two loudspeakers to deter intruders. “The monotonous job of patrolling is just not suitable for humans,” reads Aptonomy’s website. Boasting night vision as well as conventional cameras the aerial guard can patrol at night, and a thermal camera is in the pipeline for long-distance identification. The drones, which automatically return to a docking station when battery runs low, charge in just 15 to 20 minutes. The drone can fly along preset routes, but a guard based in the monitoring room can wrest control of the unit if suspicious activity be detected and they can verbalise a warning message that can be sent via the on-board loudspeakers to an intruder. As is often the case in this field, regulatory constraints are the biggest roadblock to getting products to market. US airspace rules do not allow unmanned aircrafts to fly at night or operate autonomously beyond their operator’s sight. Aptonomy says its security drone also uses artificial intelligence to fly autonomously at faster speeds and lower heights, dodging obstacles along the way. The startup believes that businesses with lots of infrastructure-related assets will want to use their drones to supplement, or even replace, their human patrols. AI, stun guns and protocol hacks: 5 security drone innovations From the drone that chases thieves to the stun-gun-armed UAV, here’s a roundup of some of the biggest security drone innovations in this burgeoning, bewildering market.